I watch people walk by. Very few notice the mounds of yellow mushrooms that have appeared on or near the sweetgum (Liquidambar styraciflua) stump. One day, these fungi just showed up, seemingly from nothing. But there IS something. Underground. Unseen. A network of microthin filaments. These fungal filaments grow within and into and between roots, rocks, soils and other microbes. They may have been growing there for years. – Scientists are still making huge discoveries about fungi. There is much we don’t know. – In the complex world of fungi and roots, the fundamental question of “What is self?” remains unclear. I’m not sure it’s always possible to define the edge of one organism – for example the fungus – and the start of its neighbor – either another fungus, or the root of a plant. Everything is entangled and interconnected. – The effort to organize mushrooms taxonomically is ongoing. Identification often requires a microscope, and even then it’s tricky. Similar to the study of plants, you almost need to know 2 sets of taxonomy, the old and the latest. In older texts, this large phyllum was called “basidiomycetes” but they are more correctly known as basidiomycota. – About 100 yards down the street, there are more clumps of these mushrooms. Some also growing out of or near a stump; others appear to be growing out of a different kind of mushroom all together. 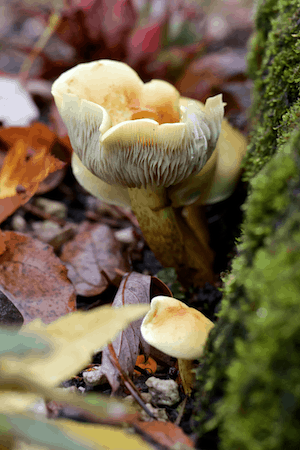 As you’re walking about in the fall, be sure to keep an eye out for these amazing organisms!